To explore varied exposure to carcinogenic, mutagenic, and reprotoxic chemicals (CMR) for French employees. Our study assessed data from the French national cross-sectional survey of occupational risks (SUMER) that was conducted in 2010 in a national representative sample of employees. We selected 28 CMR agents that were classified by the International Agency for Research on Cancer or European Union as being known or presumed to have CMR potential in humans. The association of individual and job characteristics with exposure prevalence, duration, and intensity of the CMR agents during a 1-week period was examined using multilevel logistic regression analysis. Overall, 10.4% of employees in 2010 were exposed to one or more CMR agents at their workplace, and 3.4% were subjected to multiple CMR exposures. Blue-collar workers, night-shift workers and workers with short-term employment contracts experienced higher exposure prevalence (p < 0.01) and intensity (p < 0.05). Blue-collar workers and shift workers experienced also longer exposure duration (p < 0.001). Conversely, managers, workers of large companies, and women were less exposed to CMR agents (p < 0.001). 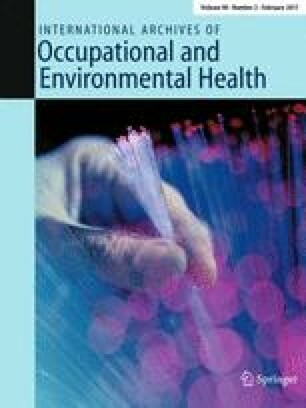 The presence of a Committee for Health, Safety, and Working Conditions, and intervention by Occupational Health and Safety officers were significantly associated with reduced exposure intensities (p < 0.001 and p < 0.05). Establishment of European CMR regulations and the existence of an applicable substitution principle reduced the exposure duration (p < 0.001) and intensity (p < 0.05). Our results point out disparities in CMR exposure and identify high-priority targets for prevention measures to help reducing social health discrepancies. We thank Sophie Domingues for her editing job on the manuscript. This study was funded by the French Directorate of Research, Studies and Statistics Coordination (Direction de l’animation de la recherche, des études et des statistiques - DARES) of the French Ministry of Labor, in the framework of the call for “Risques du travail: autour de SUMER 2010” project. European Agency for Safety and Health at Work (2014) Exposure to carcinogens and work-related cancer: A review of assessment methods. European risk observatory report https://osha.europa.eu/fr/tools-and-publications/publications/reports/report-soar-work-related-cancer. Accessed 14 Oct 2016. Guignon N, Sandret N (2005) Les expositions aux produits cancérogènes, mutagènes et reprotoxiques, Documents pour le Médecin du Travail Etudes et enquêtes N° 104 INRS, p 471–83, French http://www.inrs.fr/media.html?refINRS=TF%20144. Accessed 14 Oct. 2016. Kogevinas, M, Pearce, N, Susser, M, Boffetta, P (1997) Social inequalities and cancer eds IARC scientific publications no. 138, International Agency for Research on Cancer, Lyon. https://www.iarc.fr/en/publications/pdfs-online/epi/sp138/SP138.pdf. Accessed 14 Oct 2016.